How to Fix MS Word Unreadable Content Error? I read out the details section and click on the OK button. Again I got an error message from Microsoft Word “Word found unreadable content in Your_filename. Do you want to recover the contents of this document? If you trust the source of this document, click Yes”. How to fix MS Excel blank worksheet issue? Blank Excel file problem is a very irritating situation. In this case, you will be unable to see the content of the file. Here, I am going to share some solutions to fix this issue. Ignore Dynamic Data Exchange (DDE): Some applications can interrupt MS Excel to open the worksheet or Excel shows blank worksheet. With DDE option, Excel can share the information with other applications. To stop this process, go to File->Options->Advanced. 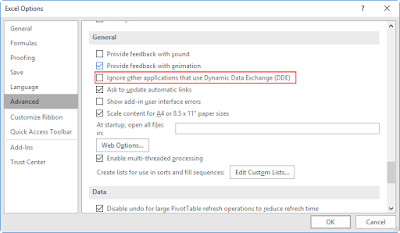 Check the General section and check the “Ignore other applications that use Dynamic Data Exchange (DDE)” and click OK to save the setting.